Thirsty Pilgrim: Zoigl, Zwickel, and Shut Up and Drink It at Bruxellensis. Zoigl, Zwickel, and Shut Up and Drink It at Bruxellensis. The nice thing about this weekend's Bruxellensis is that the organizers have done all the work for you. They've been selective about who can participate, and it's hard to find a bad beer there. OK, you might find something that doesn't suit your taste. But will it be boring? Unlikely. Might even open your mind to something new. This fest is small and manageable. Assuming no late additions, you can count the Belgian breweries on two hands: Blaugies, Cantillon, Cazeau, De Ranke, Dupont, Jandrain-Jandrenouille, Rulles and Senne. Just eight of them, with an emphasis on lambic, saison, and well-hopped ale. The profile, while maybe narrow, is flavorful. One of the real treats of this fest is that it's not limited to Belgian beer. You might have to live in Belgium to really appreciate the worth of that fact. It can be very, very difficult to find decent, non-Belgian beer in this country (a complicated issue best tackled another day). Altbier and Kölsch you may know personally. But how about Dampfbier, Kellerbier, Zoigl and Zwickel? Plus some Dunkels and a Dunkel Rauchbier for good measure. Mind-openers, all of them. Also: Press Andy on the differences between these styles and he'll likely give you the best advice of all. 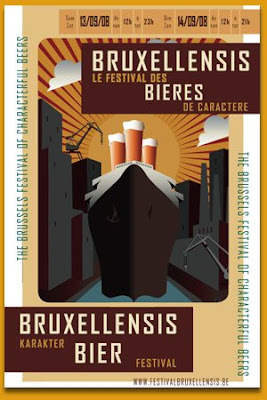 Yep, Bruxellensis is one of the best beer fests in Belgium. I went to the 2006 event. Send me an e-mail at chuck@beerandtravel.com when you have the chance. I can't find any contact info on your blog.